You can either make a booking directly on this website by using the "check availability box" to the left. Or you can call our office at 904-261-0677 and an agent will be glad to help you. Unfortunately we do not allow pets on property. 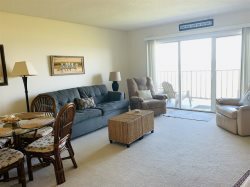 Our vacation condos are stocked in such a way that you always feel like you are coming "home" to your "vacation home" rather than returning to a small hotel room. You will be able to enjoy a full service home while you are on vacation rather than a small, cramped hotel room.